So... I dropped my camera on the sidewalk on the weekend... and I sort of got it to work for a day or two by holding the lens in place (as it came out crooked when I turned it on). But now it seems to be totally effed.... So no pics until I get a new one. I can tell you that I finished up enough stands of my new Canadians for a second company. 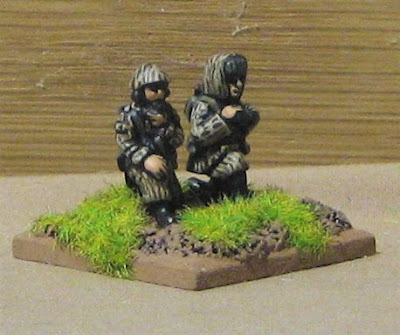 These lads I painted in the camo smocks of the Canadian Airborne Regiment. 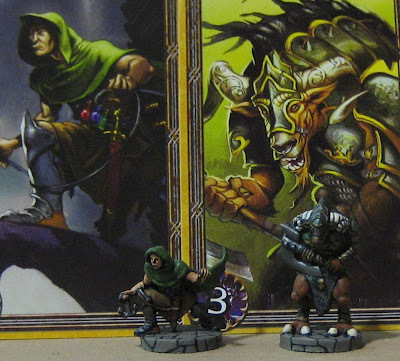 I also cranked out another nine of John's descent figures. I'll borrow Amanda's camera to take a pic of the whole bunch when I finish off the last couple. I finished up a batch of my new 20mm modern figures last night. These lads will be part of a mechanized outfit as soon as I assemble a couple of M113s! I’ve been re-thinking how I’m going to organize my forces for Cold War Commander. I think I’m going to try maneuver elements (under an HQ) being companies; with infantry units being half platoons (so 6-8 stands per company) and vehicles being full platoons (so three or four stands per formation). The forces we were using before were just a bit too unwieldy. I had finished only one of my French masters when I was making moulds last week… The prone one… So I have only a single stand of them so far but I’ve been eyeing up my VABs and plotting. I have four more infantry masters in the works. All are armed with the FAMAS. I’ll probably crank out a few Canucks and some new French over the next day or two… but what I really need to focus on the last of of John’s Descent figures - as he pointed out - he will be arriving shortly to collect them! From left to right: A French Canadian habitant militiaman, British infantryman, Highland Infantryman. All three of these are, more or less, finished. I just have to put them on bases and make moulds. I finished up a few more of John’s Descent figures. That’s about it for painting. I’ve kind of been in sculpting mode… when I’ve had a moment for hobby business. more on that in another post. Well this hasn’t been a particularly productive week for hobby stuff ORriding. I’ve had a Pilonidal Sinus infection (basically an infected pore just above my tailbone) – which has made it rather uncomfortable to SIT (…one a chair – strangely enough I was completely fine sitting on a bicycle saddle!?). Anyway it got so bad that I had some minor emergency surgery yesterday to get an abscess drained – which, I have to tell you, was even less fun that getting the old sniperoo – which was absolutely no fun at all. My doctor said it’s most common among cyclists and people driving jeeps!? When I asked her what she meant about people driving jeeps she said it was first medically described affecting soldiers driving their jeeps around in the desert… Hmmm… wonder if that could have been the LRDG…!? I can’t imagine how much THAT would have sucked driving thousands of miles across lumpy bumpy rocky deserts with one of those on ones backside!? Anyway, on the mend now and I should, literally, be back in the saddle again in no time. Just hope I don't have to go back to get the sinus removed - that seems like it would be even LESS fun! Despite all that I got some new rubber and was very anxious to try it out! 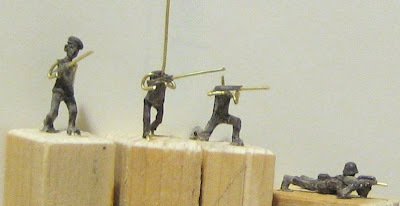 I made two moulds for the two 20mm 1980’s Canadian infantry men that I made. I’m really quite pleased with them actually. I’m already planning to do a few more – probably three kneeling poses; one with an SMG, one with a Carl G, and one with a GPMG. Next I’d like to work on some Cold War French and some generic looking guys in helmets with AK-47-ish looking rifles that could be Russians or Chinese or Africans… and finish up the Seven Years War figures I've been working on. I also finished up an observer team for the East Germans – they were actually painted last week when I did the others but I didn’t have enough base goop to finish them off. The first of John’s Descent figures. 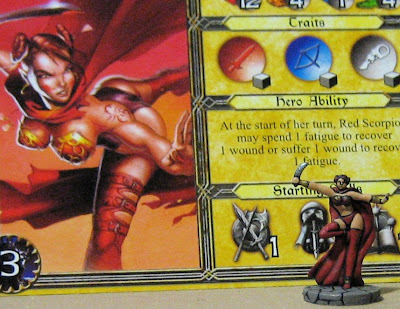 These are a pain in the bum to paint – in more ways that one!